I first stumbled upon this recipe a few years ago on a message board I frequent… And ever since I found it…….I make it very often! Whenever we are with friends or family eating….I hear a lot of “Your kids eat that?” or “How do you get your kids to eat…….” and honestly…..I find recipes that are “kid friendly”, and when they aren’t….I make my kids something different, but they have to try it! Usually when Olivia tries something…she either likes it or LOVES it….but once in awhile she won’t, and usually it’s something I wouldn’t have eaten as a child either (so I can’t blame her)! Ava will pretty much say “I don’t like this!” but she eats it anyway! 🙂 NOT THIS RECIPE THOUGH….both of my girls LOVE this salmon recipe….and when you make you will know why! It’s so simple, takes hardly any time….and the combo of maple syrup and soy sauce make for a very yummy glaze! I hope you enjoy it as much as we do! 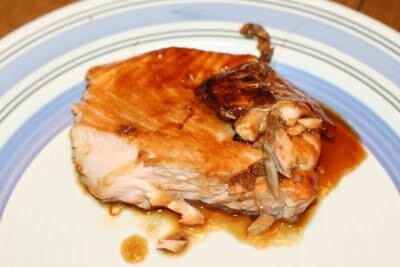 Place salmon in a shallow baking dish, and coat with the maple syrup mixture. Cover the dish, and marinate salmon in the refrigerator 30 minutes, turning once. Place the baking dish in the preheated oven, and bake salmon 20 minutes, or until easily flaked with a fork.